My elder sister Saroj Mahajan is from MP-14 Rekha Sai Mahaparayan group. She lives in Hubli and last year she had come to Pune in October to see my brother as he was in serious condition. She had come on Wednesday and that day itself she returned back and reached home. Next day being Thursday, a Mahaparayan day, she had to complete her allotted chapter. Actually her daughter-in-law would read her chapter and she would hear it. But that day as she was tired she didn't hear and just asked her daughter-in-law to read her chapter and report on her behalf. But just imagine what happened? That same night itself when she was deep in her sleep, Sai Baba came in her dream. Her dream goes like this. She saw that her room was fully packed up with lots of devotees along with Baba. Baba then told her that "Aaj Tumne Apna Chapter Suna Hee Nahi Hain, Isiliye Main Sunavunga Aur Tum Ab Suno. (then with a bang of his fist on other palm he continued) Main Nauwe (9th ) adhyaay ka path karwa ke hi rahunga" (which means "Today You Did Not Hear Your Chapter Itself, Hence I Will Make You To Hear And You Hear It. I will make sure that 9th chapter is read"). Her dream ended here. The next day i.e Friday when she woke up she recalled what had happened. She was ashamed and asked Baba to forgive her and immediately read her same chapter again (the particular chapter which her daughter-in-law read for her on Thursday, which she did not hear it) and it was the same 9th chapter as per allocation list. After that she had pinged me and shared her experience. I was wonderstruck and through this experience I understood what Pooja always said that its not her but it is Baba Who is conducting this Global Mahaparayan. But still I had got the answer to my question which I had asked Pooja about false reporting. The second experience which I wish to share is of my other elder sister Santosh Garg, who is also one of the member from MP-14 Rekha Sai Mahaparayan group. When we had just started our Mahaparayan last year from 30th September 2017 i.e from Dushera day, initially everyone was allotted with only one chapter to read. On Diwali day and also it was a Thursday being a Mahaparayan day, one chapter was allotted to everyone to do the parayan. As it is known that on Diwali day all would have lot of work so all are very busy due to which that day almost everyone were late in completing their allotted chapter reading. In the same way my sister also dint give any confirmation till evening. So when I pinged her up in the evening, her daughter-in-law told me that mummy had already finished reading her allotted chapter and I will send her confirmation. But just see what had happened, Oh my God! actually my sister had lied out of fear of non completion. Please hold on to know now what Baba did. That same day itself at night when my sister went to sleep, Baba came in her dream and told her that "Utho, Aur Apna Chapter Padho" (which means, "Get Up And Read Your Chapter") as Baba knew that she had not read and had done false reporting. She was shocked, she immediately woke up and the time was 11:30 pm and still there was half an hour. She read her chapter within a span of half an hour and completed her reading within 12 a.m. The next day itself she told me and confessed about what had happened. I was amazed and told her never to do this again henceforth. Being the class teacher of our group and her younger sister too I also scolded her that is why I was not willing to take you for Mahaparayan. My niece and so many devotees globally are putting in so much efforts for its success. But later Baba too calmed me by making me understand the beautiful leela. Baba once again had showed His miracle and this time I got my answer. We all know that we need to finish reading our allotted chapter within timeline i.e 7:30 p.m which is set for convenience of volunteers as they have to track thousands of devotees across the globe as sometimes people forget or even read wrong chapters, but at any cost we need to complete our parayan on Thursday itself that is before Thursday gets over to complete our that day’s Mahaparayan. Even if single chapter remains unread the parayan remains incomplete and we need to repeat the parayan of that particular classroom next day again. But Baba took care so skilfully that He came in my sister's dream, woke her up and made her read her allotted one chapter and completed it before 12 night. These two above experiences are the best instances which shows that "Baba is Himself looking after each and everything so skillfully and wonderfully taking care of Mahaparayan on Global Level". Through these above couple of experiences Sai Baba gave answers to my question too. Although Pooja Garg is my niece but at first I was hesitating to tell about these couple of experiences as she may feel bad as she is putting lot of efforts for organizing this global Mahaparayan and I thought that such things may demotivate her but later I thought that these are unique and wonderful leelas of Baba, and Baba too made sure that I shared it with her which is really a great experience. Pooja was amazed and asked me to pen down so that all will understand its essence. Sorry for the delay in sharing these experiences. All those who are in Mahaparayan are chosen by Baba Himself. 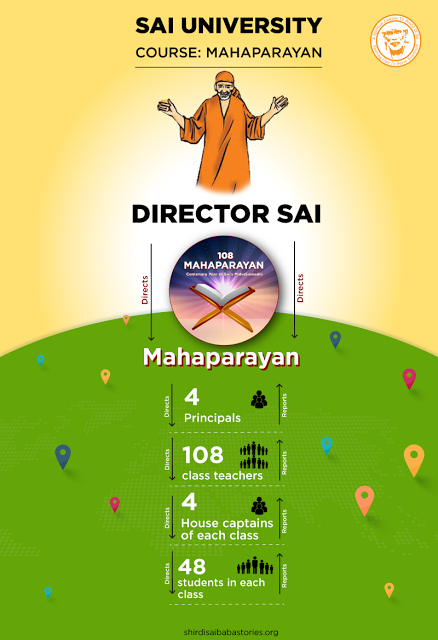 Hence Mahaparayan is boon to all those who are part of it. Thank You Baba for blessing us with Mahaparayan which is a Blessing in true sense for the mankind. Om Sai Ram. What to speak of Baba's inscrutable ways which are beyond our intellect? Firstly thank you mamiji for all your service to Baba and also sharing one of the most amazing leelas of Mahaparayan. Truly speaking, I did not feel bad at all but extremely happy and more motivated as people too would be convinced that it is not any Pooja Garg or Rekha Goyal who are trying to conduct this Mahaparayan. I really thank your both sisters too as it takes lot of courage to confess. It was actually Baba’s way to answer your doubts through your sisters only, which you had asked when I was pushing you to be the class teacher and show that He is aware of every little thing. Really how blessed are your sisters that Baba chose them to show His leelas to the world. After all His ways are His ways! Love You loads Deva. Jai Jai Ho Sai...! EVERYDAY I JUST WRITE SAI...SAI... BUT TODAY DEVA PULLED ME TO WRITE THE BELOW. MAHAPARAYAN IS NOT JUST REPORTING FOR DUTY OR TO READ THE CHAPTERS ALLOTED TO US BUT ITS OUR LOVE FOR BABA AND THE THE RECIPROCAL OF IT IS THAT HIS LOVE REACHES US IN ABUNDANCE AND ENLIGHTENS OUR SOUL/MIND AND BODY. Om SaiRam.I leave it to you to take care of all of us the way you want.i trust you and you give us the best based on our merits. Om sai ram, iam very happy after starting mahaparayanam.bless all Sai.